And, check out Renee's latest book, ​The Anchor Clankers. New Book Trailer for Inland! I'm very excited to share the new book trailer for my novel, ​Inland. ​​You can check it out on the Books page of my website. On February 2, 2018, I had the honor of spending the day with the students of Christ's Church Academy at their Author Extravaganza day. I visited with the 5th graders and participated in an author panel, along with Jane R. Wood, Renee Garrison and Evelyne Holingue, where we talked about writing, research and finding ideas for stories with the 6th, 7th and 8th graders. It was so much fun discussing books with, and getting to know the students of, CCA. Thank you for inviting me to be a part of your 2018 Author Extravaganza! Silver Medal at the FAPA President's Book Awards! ​On August 5, 2017, the Annual 2017 Florida Authors and Publishers Association President's Book Awards recognized Inland by Stacey Horan, in the category of Young Adult Fiction (Paranormal/Sci-Fi/Fantasy), as a Silver medal winner. It was a wonderful ceremony. Thank you to the FAPA Board for making it so memorable. New Release! The Elixir Vitae Adventures: ORTUS is now available. 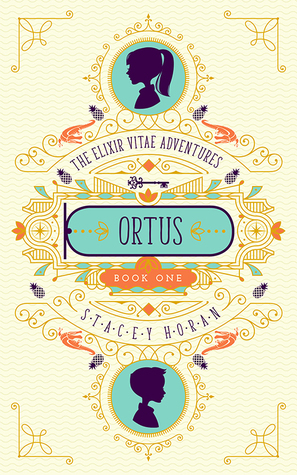 I am very excited to announce that the first book in my new series is now available -- The Elixir Vitae Adventures: ORTUS. This is Book One of a new middle-grade adventure series involving mysteries, riddles, travel, family secrets...and a bit of magic. It is available in paperback and ebook from Amazon. ​Pick up a copy today. I hope you enjoy it -- and I wish you many happy adventures! As I’ve mentioned, my husband and I used to live outside NYC in Westchester. Most of our trips into Manhattan began with a train ride into Grand Central Terminal. They ended the same way – with a train ride home. When I was writing the ending for Inland, I thought it was only fitting that the story end the same way it began – at Grand Central. I spent a lot of time at that station, taking notes and photos and choreographing movements for the story. I can’t step into Grand Central now without seeing my characters running through the halls. It makes me smile. All train stations have moments of madness followed by moments of peace. The trains arrive and depart; the crowds come and go. The periods of calm are punctuated by storms of chaos. In the case of Grand Central, the storms are large and frantic, while the calm periods can be a bit eerie. Grand Central is vast and imposing and humbling. Maybe it’s the celestial ceiling, but one can’t help but feel small there – a single person out of hundreds of thousands to pass through the station on any given day, one star out of all those in the galaxy. In Inland, the main character, Cat, begins her adventure in Grand Central. When the time comes, she decides that it must end there as well. In that station, Cat’s story plays out surrounded by strangers, all travelling through their own stories, and most of them never even take notice of Cat. This, to me, is the essence of Grand Central. In fact, it’s the essence of NYC. There are millions of people, millions of stories, all carrying on at the same time. Too many to count. Too many on which to focus your attention. Every once in a while, however, we see one – one person, one story – and it captures our attention. I enjoyed writing Inland and learning about NYC, and I love the story’s characters (who still wander through my mind every once in a while). I realize my book, Inland, is one of millions in print, but I hope you’ll notice it, read it, share it. Most of all, I hope you enjoy the ride. One of the craziest things I ever experienced in New York was watching the giant balloons being inflated the night before the Macy’s Thanksgiving Day Parade. I had heard it was a fun thing to do. I researched it online. It seemed like one of those New York-only type of events that I shouldn’t miss out on. So, my husband and I ventured into NYC on Thanksgiving Eve and made out way up to the Upper West Side…and found bedlam. We arrived in the vicinity of the American Museum of Natural History, which serves as the staging area for the giant balloons, in the late afternoon. We were still a couple of blocks away when we ran into a wall of people. I’ve never seen so many people shoved into such a small space. Everyone was trying to inch their way forward, but no one was moving. We joined the crowd – and once we were in, we were in. There was no getting out. It was a sea of humanity, barely flowing in any direction. It took us hours, but we finally made it into the main line and around the Museum to see the balloons. By then, all the balloons were inflated and pinned down on the ground under heavy rope nets to keep them from flying away. I can’t say it was enjoyable. I would definitely not characterize it as fun. And unless your idea of a good time is to spend several hours standing shoulder to shoulder with complete strangers who are jostling for every inch of ground they can gain, then I would probably recommend that you not add it to your bucket list. There was one bright spot, however. Most of the balloons were posed in rather indecent positions. By that, I mean that a couple of superheroes, some cartoon characters and an elf were all packed tightly together, one in front of the other, and arranged with faces down, butts in the air. You couldn’t help but giggle. No one could. So, I shared a laugh with several thousand people in line with me. And when the humor of balloons’ unfortunate poses wore off, we were all left to shuffle towards the exit, one inch at a time. I was writing Inland when my husband and I made that unpleasant trip to see the parade balloons. I knew, as I stood there staring at Charlie Brown’s head shoved up against Kermit the Frog’s backside, that this scene would have to make it into the book. Full disclosure: I wrote about the chaos of the crowd -- not the lewd balloon positions. Sorry! As I mentioned in a previous post, Central Park is my favorite place in all of New York City. I grew to love Central Park by running around it…literally. My husband and I spent most weekends training for and running in races in Central Park. We joined the New York Road Runners shortly after moving to Westchester, and signed up for as many races as we could. Now, don’t get the wrong impression. I’m a runner because I run. But that’s like saying I’m a golfer because I’ve played golf. I’m not very good at either one. I can complete the activity, but no one is throwing sponsorship or prize money at me. I didn’t run any of those races in Central Park to compete, except maybe with myself. I ran them just to complete them. Running around Central Park is a great way to experience it. The park is vast and varied. Its roads twist and turn. There are hills (which seemed like mountains when I first started running them) and woods and small hidden pathways. You can easily lose yourself inside Central Park, either by accident or on purpose. And you’re not alone. On any given day, rain or shine (or snow), runners of all shapes, sizes and skill levels take to the roads and paths…sometimes to race, more often to train, and mostly just to enjoy running in the park. When I wrote Inland, I knew the main character would be a runner -- and I wrote her to be a much better runner than me! Cat is a competitive runner, and Central Park is her home turf. I saw of plenty of runners like Cat when I was training in the park, all of them flying past me as if I was standing still. I will never be a runner like Cat, but that doesn't mean I can't enjoy the activity in my own way...and at my own pace. The next time you're in Central Park, lace up your shoes and go for a run. Short or long, it doesn’t matter. Central Park and your fellow runners will be happy for the company. Central Park – it’s my favorite place in all of New York City. Hands down. No contest. It is a refuge from the storm, a splash of green on a vast grey canvas, a moment of quiet in the unceasing symphony that is NYC. I am drawn to it – its trees, ponds, and open fields. And I’m not the only one. Visit Central Park on a nice day, and you’d swear all of Manhattan had the same idea. It is full of life, full of green things growing, full of locals and tourists alike. To me it represents the essence of NYC: it is vast, it is varied, it is always changing, and it is welcomes everyone. My husband and I spent a lot of time in Central Park, and we visit it every time we are back in NYC. Regardless of the season, Central Park is lovely. It is both manicured and wild, both open and secluded. It is communal by its very essence, and yet you can’t help feel that it was put there just for you. Many of the story ideas in Inland were created during my visits to Central Park. It is the best place to think – and just to be – in the entire city, in my humble opinion. Central Park plays a key role in Inland. It is a safe haven for the main character, Cat. When she is there, she feels free, at home, herself. It gives her courage when she needs it; it provides protection when she is in danger. She knows every inch of it. She belongs to it, and it to her. Central Park is an important part of Cat’s story, and it holds a special place in my heart. New York City is a place of landmarks aplenty – famous buildings, monuments, facades and locations that people recognize at a glance, even if they’ve never visited in person. The landscape of NYC is familiar to us from decades of movies and television shows, whether filmed on location or on the sound stages of Hollywood. Some of these landmarks are as famous as NYC itself. They have become shrines, brand icons and institutional ambassadors (of sorts). When writing Inland, I had to include at least a few of NYC’s well-known landmarks. Frankly, it was too hard not to. How do you write a story set in NYC and never discuss any famous aspects of NYC? I worked hard not to overload the book with references to such landmarks. Inland is not a travel guide, nor is it a sightseeing cheat sheet. I chose to feature only a few sites prominently (such as Grand Central), while others are mentioned merely in passing as points of reference (such as Rockefeller Center). The ones I did include are among my favorites. If I left out your favorite(s), I apologize. NYC has something famous for everyone, but there is way too much to include in any one story. Everything and everyone in New York City has a location, and that location is in relation to everything and everyone else. By that, I mean, you describe where you are and where you are going in terms of corners, intersections, blocks, cross-streets, buildings and landmarks. You are at the corner of X Street and Y Avenue, or you are on X Street between Y and Z Avenues. You are across from, next to or three floors above…whatever. In a city where most of it is laid out in a neat and tidy grid, your bearings are easily obtained as soon as a point anywhere else in the city is mentioned. Upper, lower, mid; east and west; avenue and street – all of this is vital information when navigating NYC. As with anything, there are exceptions to some of these rules (such as Greenwich Village), but not all of them. Even if you encounter a road with a bend or a name or a five-point intersection, you are still somewhere that can be readily defined in NYC terms – south, west, corner of, etc. When writing Inland, I made a good faith effort to describe locations in NYC (and in the alternate universe, for that matter) with some degree of accuracy. For example, you can trace Cat’s exact route to Grand Central at the end of the book. The only conscious exception I made was with regards to the location of the government office. Because of the sensitive nature of its remit, I wanted the office’s location to be kept a secret from the reader. However, I do mention that it can be found in a rather unremarkable building in Midtown – and that certainly does not give much away. ​No matter where you need to go in New York City, you always have at least a handful of options for how to get there. It’s an obsession, frankly. Transportation is a constant consideration for anyone in NYC, whether you live there or are just visiting. How? How long? How much? These are all questions that get asked over and over again each day. Subway, train, bus, bicycle, pedicab, car service, taxi cab, taxi alternatives and your own two feet – take your pick. When I was writing Inland, I tried to downplay the issue of transportation, as it was impossible to avoid it altogether. My characters lived in NYC, and they couldn’t just stay in one place for the whole book. They had to move around, get from place to place, and there was no shortage of options for doing so. So, I stuck to the basics: train, bus, cab and feet. I wanted the focus to be on the movement, rather than the mode of transportation (other than that fateful train in Grand Central Terminal, of course). Even if you don’t need to go anywhere in NYC, you can’t avoid the transportation obsession. It’s on every street, at every corner, and under the streets as well. It also fills the air, that constant sound of horns blaring and sirens wailing. You can’t escape it, so don’t even try. Just weigh your options, pick one and be on your way. There’s no right or wrong answer – only time wasted by spending too long trying to decide. One of the most charming aspects of the island of Manhattan is that it is freckled with parks. Some are world famous (such as Central Park), and others are tiny, hidden gems. I’m a big fan of Bryant Park, located right behind the Mid-Manhattan Library. It’s a little green oasis in the dense, high-rise landscape of Midtown. Bryant Park is not very large, but it’s big enough for the necessities of any good city park: places to relax, flowers and trees, a large fountain and plenty of entertainment. I always like visiting Bryant Park, although it’s usually for just a short rest during a whirlwind tour through NYC. It’s a great venue for people watching and for catching your breath before launching yourself back into the fray. In Inland, I used Bryant Park as the setting for a scene where some truths are revealed using stark contrasts, much like the park’s soft garden landscape set amongst towers of concrete, glass and steel. Bryant Park is a small port in the storm of NYC. It does not pretend to be an impenetrable sanctuary, nor would we want it to be. Okay, maybe the New York Public Library (Mid-Manhattan Library on the corner of Fifth Avenue and 42nd Street, to be exact) is not exactly a hotspot, but it is one of my favorite buildings in New York City. I remember visiting the Mid-Manhattan Library on my very first trip to NYC (too many years ago to count). I was in awe: the lions, the columns, the grand staircases, the carved wood, the chandeliers, the frescos and, of course, all the books. I knew one of the key scenes in my book, Inland, would be set in the Library. When my main character learns a big truth about the alternate universe called Inland, I wanted it to happen in the Library. It’s a familiar, comfortable place, as all libraries are, yet it is imposing and intimidating at the same time. She would feel at home there and yet be easily unsettled and overwhelmed. Thanks, Mid-Manhattan Library, for providing the perfect setting. ​So, I needed to hide the portal to an alternate universe in one of the busiest train stations in the world. It shouldn’t be that hard to do, right? Once I knew that Grand Central would play a central role in Inland, housing the secret portal between our world and the parallel universe known as Inland, I needed a way to access that world and a specific location where the portal would be hidden. If you’re going to set the portal in a train station, the obvious mode of transportation between worlds is by train. Well, it may not be the obvious choice for many people, but it was for me. And, when I was looking for a place in Grand Central to hide the portal, I found no shortage of nooks and crannies. Specifically, I needed a little-used, out-of-the-way platform…and I found one: Track 100. It’s tucked away on the lower level, apart from all the other tracks. It seemed like the perfect place to catch a train to another world without anyone noticing. Hey, anything is possible in New York City, right? Since my new young adult novel, Inland, has just been released, I wanted to provide a little insight into the story’s development, as well as some of the aspects of New York City that provided inspiration. I’ll be posting a series of photos and anecdotes over the next several weeks explaining how the sights, sounds and spectacles of New York City played a role in the creation of Inland. Let’s begin at the beginning, which, ironically, is a actually a terminus. When my husband and I lived in Westchester, NY, we traveled into Manhattan on a regular basis. 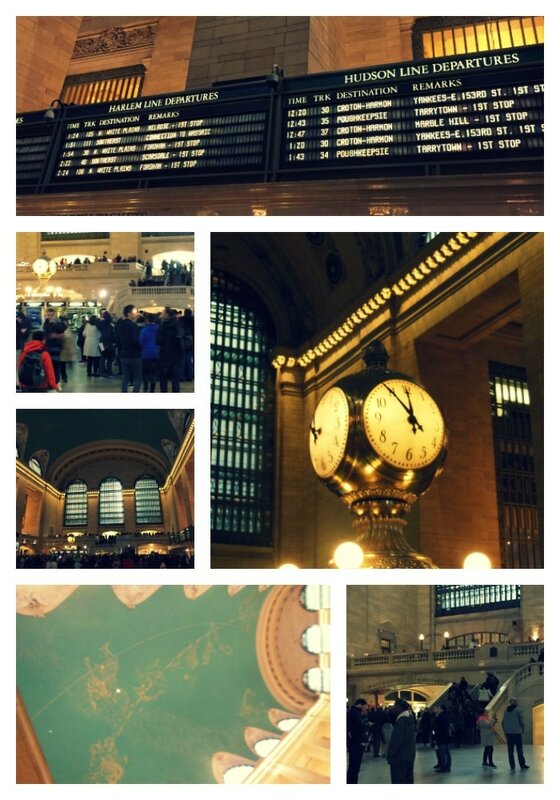 Most of the time, we took the train (the Harlem line) into Grand Central Terminal. It’s an above-ground trip for most of the way, until the very end when the train enters a tunnel. The last few minutes of the trip are spent in darkness as the train slows and arrives at a platform. We usually arrived on the lower level and fought our way through the crowds in the dining concourse to emerge on the upper level. In the main concourse, throngs of people scurried around under the celestial ceiling and the watchful gaze of the four-faced clock. For me, this was the starting point for so many wonderful memories in NYC. I knew Grand Central would feature prominently in my story when I started writing Inland. Hundreds of thousands of people pass through Grand Central every day. If you need to hide a secret portal to an alternate universe, why not hide it in the middle of so much chaos –- where it could easily go unnoticed? For me, Grand Central Terminal’s size, location and history made it the perfect place to hide just such a secret. New Release! Inland is now available. 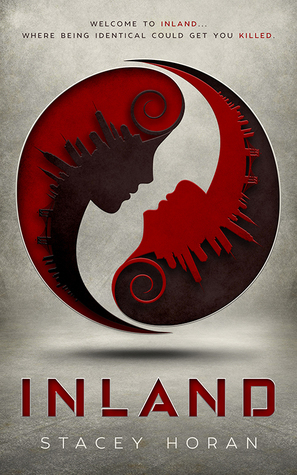 I’m so excited to announce the new release of my latest young adult novel, Inland. It is a sci-fi thriller that takes place in New York City – both here and in an alternate universe called Inland. In celebration of this new release, I’ll be posting photos and offering insight into some of the sights, sounds and spectacles of NYC that feature in this book. Stay tuned…and pick up your copy of Inland from Amazon today. I’m thrilled to finally be able to share this story with you. Hope you enjoy it! 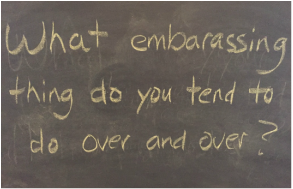 What embarrassing thing do you do over and over? ​I’m embarrassed to admit it, but I forget people’s names. Always have, and it’s possible I always will. I’ve tried different tricks and techniques, but nothing has been very helpful. It’s like my brain is a hockey goal, and there is this NHL All-Star goalie in my head who smacks away anyone’s name as soon as it is uttered. My husband and I attended a function recently where we ran into a couple that we met at the previous year’s event. Now, I recognized the couple as soon as I saw them. I remembered their stories, where they lived and why they were at this particular event. I remembered all of that, but their names escaped me. Luckily, this was a party where everyone was wearing a nametag. As soon as I saw their names, I remembered that, yes, they were, in fact, Tim and Holly. (These are not their real names, of course. I’ve changed them because they are innocent parties in all of this.) Since I was going to be seeing them a few more times that same weekend, I was determined not to forget their names again. So, I checked that brain goalie and let Tim and Holly’s names sail into the net. (She shoots, she scores!) Unfortunately, it’s unlikely that I’ll get to see Tim and Holly again until next year’s event. By then, it’s entirely possible that I will have forgotten their real names and mistakenly call them Tim and Holly. As I stockpile candy and get ready for the trick-or-treaters, I’ve been thinking back to some of my Halloweens as a kid. What was my favorite Halloween costume? Well, I can’t recall most of them. I do remember my sister and I wearing matching clown costumes that my mother made for us when we were very young. Mine was pink and hers was blue. When I outgrew mine, my sister wore it and my little brother wore the blue one. (Hand-me-downs were a big thing in my family.) Most of my costumes were homemade. My mom sewed some of them. Others were cobbled together using old dance recital costumes and stuff from around the house. I think my favorite was my red princess costume. I wore a small crown and a red satin leotard from a prior dance recital, and my mom crafted a full-length red tulle skirt for me that skimmed the floor and swayed back and forth as I walked. I don’t remember how old I was that Halloween, but I couldn’t have been more than 8 or 9. I do remember walking from house to house trick-or-treating and feeling absolutely regal. My Halloween princess costume was nothing compared to the Disney dress-up costumes that girls have today, those sparkly little things made to look just like the ball gowns of Cinderella, Elsa or Rapunzel. Nevertheless, that red, homemade costume made me feel fancy, grown-up and very special. Thanks, Mom! I spent this past weekend with my youngest niece and nephews. My husband and I joined them (and their parents) for a weekend at Disney World. It was fun and exhausting, and we ate far too much. Possibly because of the hot weather or maybe because we were simply on vacation, we all ate an above-average amount of ice cream. We were limited in the flavors we could choose at most of the ice cream stands: vanilla, chocolate or a swirl of both. (I usually chose the swirl because I was too tired to pick between the two.) However, if my choices are unlimited, I will usually choose mint chocolate chip. (This is assuming I don’t have to eat it all day, every day. See my early post for this particular hypothetical dilemma.) I don’t know when I was first introduced to mint chocolate chip ice cream, but it’s been my favorite since I can remember having a favorite. I can blame my mother for this particular penchant, because mint chocolate chip is her favorite as well, and I’m sure she’s the one who got me hooked. Curiously, when my sister was very young, she liked ice cream that began with the letter ‘B’: banana, black cherry and bubblegum were her top three favorites. Over the years, I’m sure her tastes have changed, evolved and expanded to include more of the alphabet. All that being said, I ate enough ice cream this past weekend, regardless of the flavor, to last me awhile… or at least until next weekend. I am thrilled and honored that my short story, The Bench at the End of the Dock, was selected by Jacksonville Magazine as the winner of their 2016 Fiction Writing Contest. Go buy a copy of their October 2016 issue! It’s on newsstands now. (This issue was a bit delayed making it to the shops – no thanks to Hurricane Matthew, I’m sure.) You’ll find my short story on page 90. I confess that I almost didn’t enter the contest. With only a few weeks until the deadline, I decided to write this story and submit it. It was an exhausting and emotional exercise to get this story out of my head and onto the page, but I’m very pleased with the result. Jacksonville Magazine did a lovely job with the layout, and it is so exciting to see my name in print as the story’s author. I enjoyed getting to know the characters in this story, and I think they will stay with me for a long time. I’m really pleased that JAX Mag readers get a chance to meet Guy Babbitt and Annaleigh, too, and learn just a small part of their sweet story. Thank you, Jacksonville Magazine, for choosing my short story. It is a wonderful honor.